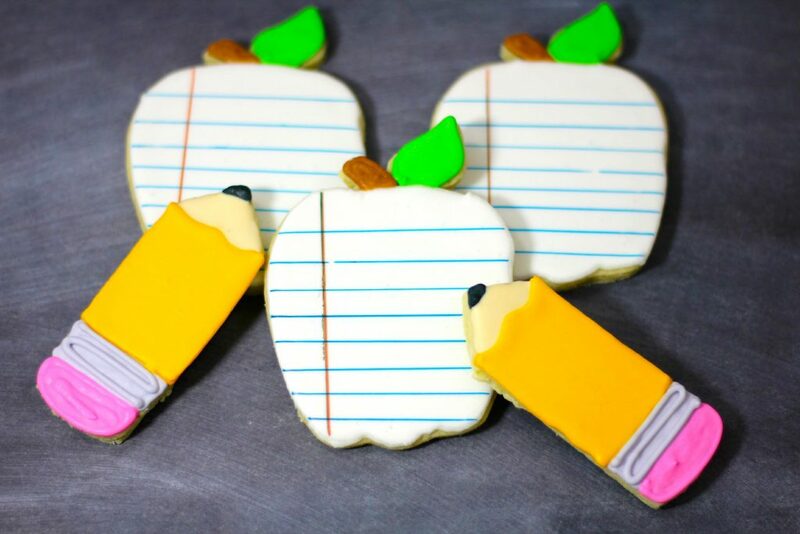 These AMAZING school notebook sugar cookies are definitely an eye catcher and make perfect teacher appreciation day gifts and back to school snacks for kids! These are great to make at night when you need to unwind from a day of work and get crafting something beautiful! 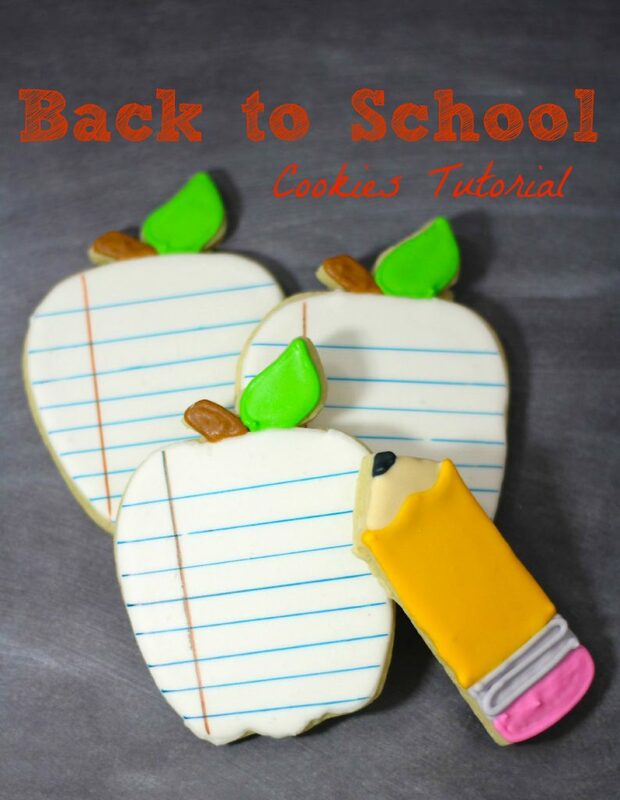 Below you can read through for the cookie and icing recipe along with specific directions on how to decorate these. -Roll the dough out on the cutting board and using your cookie cutter begin to make your cookies. – Pull out 8 bowls and begin to divide the icing. – Bowl #1, put 2 TBSP of icing in , add several drops of brown gel food coloring stirring well until all of the color is blended. Bowl #2, put 2 TBSP of icing, add several drops of black gel food coloring stirring well until all of the color is blended. Bowl #3, put 4 TBSP of icing, add several drops of green gel food coloring stirring well until all of the color is blended. Bowl#4, put 5 TBSP of icing, add several drops of ivory gel food coloring stirring well until all of the color is blended. Bowl #5, put 5 TBSP of icing , add several drops of purple gel food coloring stirring well until all of the color is blended. Bowl #6, put 5 TBSP of icing, add several drops pink gel food coloring stirring well until all of the color is blended. Bowl #7, put 1/2 C of yellow gel food coloring stirring well until all of the color is blended. Bowl # 8 remains white. -Allow the icing outline at least 30 seconds to dry before filling the body of the cookie in with the other icing*. ( After outlining all of these cookies you can push some the remaining icing into a bowl and add the 1 tsp of water and mix well to get the right consistency .) Leave some of the icing in the frosting bag for additional work if needed on each of the cookies. Using a butter knife to fill in or spread the watered down icing. -Notebook paper apple. Outline the apple except the stem and leaf in white, after 30 seconds, fill in the body of the apple in white. Outline both the stem in brown and then the leaf in green then fill them each in with corresponding color. Allow 5-10 hours to completely dry. After the apple is dry, using the Foodwriter edible ink pens for draw the blue lines of the paper and the red line for the margin. -Pencil. Using the ivory and black icing outline the wood part of the pencil and fill it in. Next, outline the lead of pencil in black then fill it in with black. 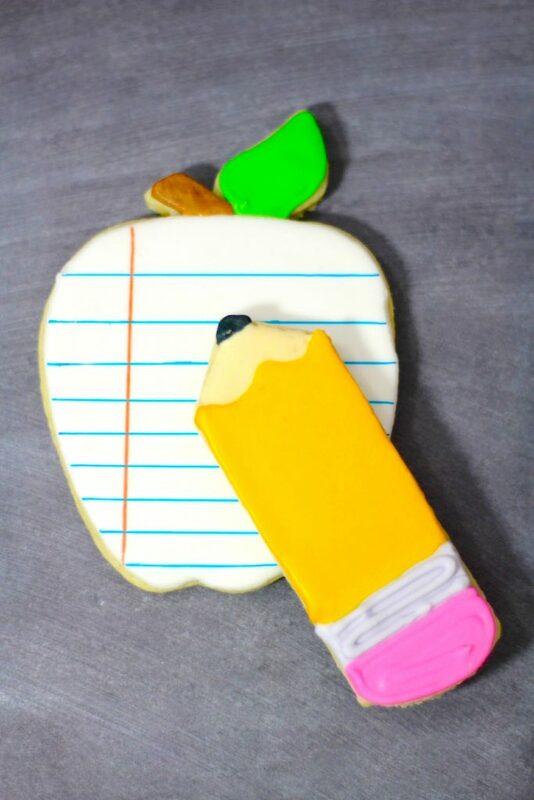 Outline the body of the pencil in yellow then fill it in with the watered down yellow icing. Do not outline or fill in the eraser area with yellow but outline and fill in with pink. Allow to dry before adding the purple stripe (outline and then fill in this spot) between the eraser and the body of the pencil. -Allow the cookies to completely dry for 5-10 hours.